A woman's big heart cost her her job serving lunches at a middle school when she says the school terminated her for 'stealing' when she gave a hungry 12-year-old girl who couldn't afford lunch a free meal. 'I know I screwed up, but what are you supposed to do when the kid tells you that they’re hungry and they don’t have any money,' former Irving Middle School lunch lady Dalene Bowden told the Idaho Statesman. Bowden, who worked in the Pocatello/Chubbuck School District in Idaho, was terminated last Tuesday for the against-the-rules freebie. Bowden, who says she's a breast cancer survivor, had worked at the school for three years. She wrote that last year during an assembly, the kids gave her a standing ovation when her face and name came on the screen. 'That’s probably why the girl came to me when she didn’t have any money,' she said. Bowden admits she'd already once received a warning about her generous nature - she'd once given a kid a free cookie. The compassionate cafeteria worker said that when she first got in trouble, she offered to pay the $1.70 lunch cost, but she was rebuffed. 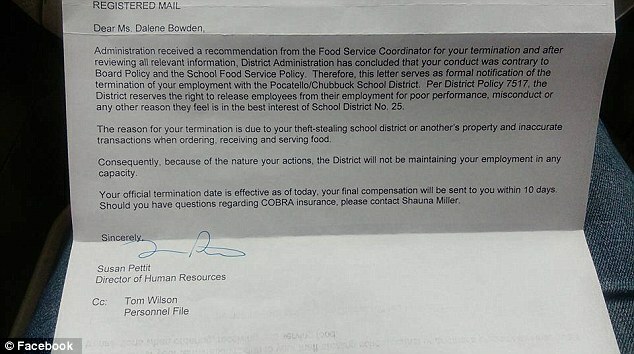 Bowden posted the letter on Facebook and wrote, 'This is just breaking my heart,' and added that the school didn't even include her final check. Online support is gathering steam, however. Raushelle Guzman, of Pocatello, who has two children in the same school district, thinks that schools need more people like Bowden, not less. She has started an online petition to get the school to reinstate Bowden's job. It has so far received almost 38,000 signatures. Bowden, who has so far raised over $1,000 for her plight, is now trying to raise enough cash to hire a lawyer to change the law. 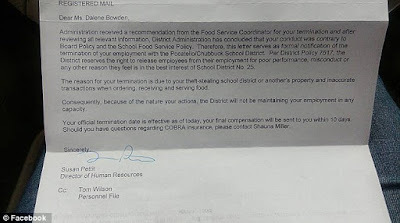 Interim Superintendent Douglas Howell said Bowden's school district, District 25, works to make sure children who live in economically disadvantaged homes receive free or reduced hot lunches, but did not clarify why the girl in question could not get a meal.